I have a friend who used to work in the famous Bewley’s Cafe on Grafton Street in Dublin. She told me once about about the letters they got around this time of year, usually from tourists who had bought a loaf of barm brack in the store to take back home with them. The people writing the letters were concerned that they’d found a ring in their bread, with one person saying they’d had it appraised, and another one joking that they were relieved they hadn’t also found the finger that came with the ring. Most people sent the ring back. They obviously didn’t know just what they’d bought. Barm brack (or báirín breac in Irish, from báirín, a loaf, and breac, speckled, due to the raisins in it) is a traditional Halloween treat, falling somewhere in between regular bread and cake. What makes it special is the ring and coin that are usually baked into the bread, turning it into a bit of a fortune‐telling game: whoever gets the coin will be rich, and whoever gets the ring will be married within the year. Who knows what chances for love those well‐meaning tourists sent back? 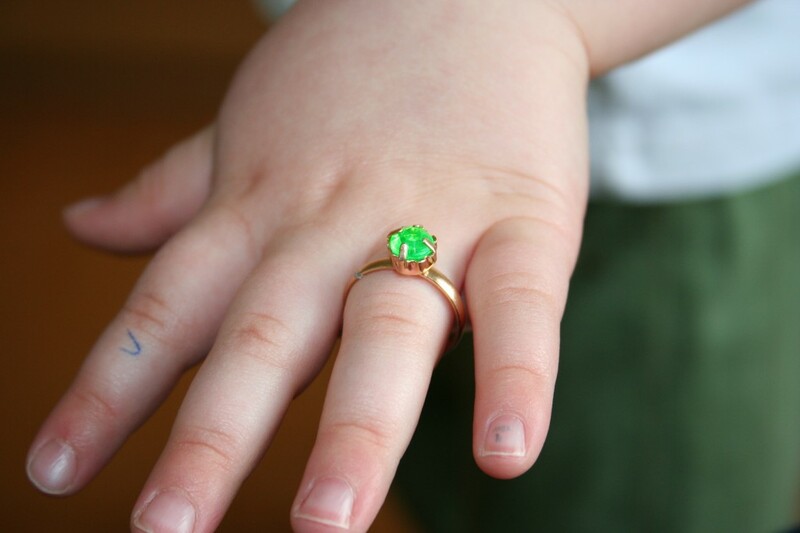 This is the ring that came in the store‐bought barm brack I bought last year (oh, those chubby, dimpled little toddler hands get me every time). But after making my own this year and seeing how quick and easy it is, we’ll only be having homemade brack from now on. Rick Bayless suggests using 2 lb (900 g) of pork shoulder or beef chuck, cut into 1‐inch cubes, in place of the chicken. If using pork, he recommends replacing the potatoes with sweet potatoes cut into 1/2‐inch cubes. If using beef, try quartered sweet turnips, cubed carrots or peeled, cubed yuca. Chicken a la Veracruzana can also be used as a soft taco filling — just shred the chicken and stir it into the sauce with the olive and parsley and smash the potatoes into smaller pieces (this is how I served this meal to my kids, with a little grated Cheddar cheese too). 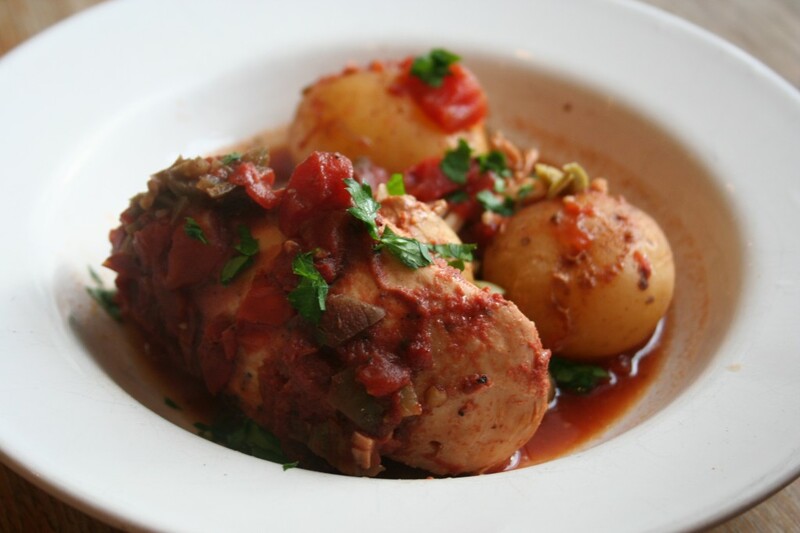 Place the potatoes over the bottom of a slow cooker and put the chicken breasts over the potatoes. In a medium bowl, mix together the drained tomatoes, jalapenos, garlic, Worcestershire, thyme, cloves, cinnamon and salt. Pour the sauce evenly over the chicken. Set the lid in place and cook on high for 6 hours (the dish can hold on the slow cooker’s “keep warm” function for 4 more hours or so). Carefully transfer a chicken breast and a portion of potatoes to each of 6 dinner plates, leaving as much sauce behind as possible. Mix the olives and parsley into the sauce, then taste and season with more salt if it needs it. Spoon the sauce over the chicken and potatoes and serve. Put the chicken in a medium‐large heavy pot, preferably a Dutch oven, and top with the potatoes. Cover with the sauce, set the lid in place and braise at 300°F (150°C) for 2 to 2 1/2 hours, until the chicken is completely tender. Complete the dish as described above. If you want to include the traditional coin and/or ring, wrap them up well in greaseproof paper before adding them to the batter. You’d probably better wash the coin beforehand too. You can also make a yeasted version of barm brack, but you can’t beat this recipe if you want something quick and easy — it takes 10 minutes to make. If you want to elevate brack into a dessert, try this recipe for toffee apples on sugar‐glazed barm brack. Dissolve the sugar in the tea. Add the raisins and candied peel and leave to soak overnight. The next day, preheat the oven to 325°F (160°C). Grease an 8‐inch loaf tin or small round cake tin. Add the beaten egg to the raisins and peel as well as their soaking liquid. Sift in the flour, baking powder, cinnamon and nutmeg and stir well. Spoon the batter into the tin (add the charms now if you’re using them) and bake for 50 to 60 minutes, until a tester comes out clean. This is traditionally served toasted and buttered with a cup of tea.